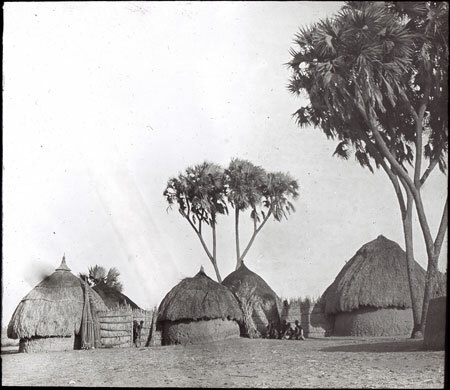 A homestead at Akurwa village, the site of one of the ten shrine enclosures of the founder of the Shilluk nation, Nyakang. The village was visited by the Seligmans in 1910. The Akurwa shrine sheltered the important ritual four-legged stool and effigy of Nyakang, used in the installation of the new reth at Fenikang. The homestead seen here is a grouping of several huts joined by short woven grass fences into a larger extended kin dwelling. The hut to the left has a more elaborate woven apex decoration. Manual catalogue entry (thermofax catalogue copy in folder '27-06 Seligman Slide Collection') - "V.g.32. Shilluk, Akurwa village. (268)"
Note on lantern slide ms ink - "V.g.32. Shilluk, Akurwa village. CGS. 268"
Morton, Chris. "View of Akurwa, Shilluk village" Southern Sudan Project (in development). 03 Jan. 2006. Pitt Rivers Museum. <http://southernsudan.prm.ox.ac.uk/details/1967.26.236/>.